Protect, enhance and preserve your printed material using our range of high-quality Laminators, Roll Films and Laminating Pouches. Critical to any Person, Company and Government body. Our range of Shredders provide high levels of security & privacy through efficient destruction documents. Guillotines are valuable equipment, which can be utilised just about anywhere where paper needs to be cut accurately with very little effort. As the exclusive supplier of Duplo's range of high-end document finishing equipment in Australia, Neopost has a solution for all sizes of print operation. Add value to your print products with an eye catching layer of Spot UV embellishment that you can touch and feel. Shredders are an important piece of equipment used for destroying private and confidential information. It is a critical part of any security process for Persons, Businesses, Government and Corporate. Our Paper Folding equipment enable you to create accurately folded mail and document, giving your communications a highly professional look & feel. Our range of Cutters, Creasers & Perforators are perfect for finishing digitally printed sheets. Drills, Staplers and other finishing accessories that will fit into any print production environment. A range of large format production printers designed to cater for signage print service providers. A wide range of printers designed to output the highest standards of print quality. Ideal technical printing solutions for users in the AEC, CAD and GIS industry. Equipment for Cutting, Trimming, Laminating & Finishing various large format print media & substrates. Essential for all print service providers, RIP software allows users to take full control over their printing. Folding & Inserting machines save time and money by automating tedious manual tasks, allowing you and your staff to focus on more productive duties. From Fastback and Colorcoil to Plastic comb and Wire binding. From Pull Up Banners and X-Banners to A-Frames and Media Racks. Lightweight & durable display systems for exhibition and promotional uses. From large lamination rolls to small lamination pouches. From envelopes and labels to sealing fluid and postage meter inks. Wide format media for walls, floors, windows and vehicles. We have you surfaces covered. Bags, sheets and oils for all of your shredding needs. Perfect for giving business cards, playing cards, calendars, brochures, etc., an individual and professional design. In addition to paper, cardboard, textiles, leather, plastics and light metals can also be processed. Stago ESM20, round cornering machine for a wide range of materials: paper, card, leather etc. The various tools from the Stago range of accessories allow angular cuts and round corners to be executed cleanly and precisely. Infinitely adjustable side guides swivel for exact positioning. Hardened steel knives can be quickly and easily exchanged. Maximum punching capacity of 40mm. Interested in the Stago ESM20? 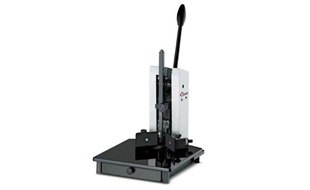 Contact us to see what this Round Corner Cutter can do for your business!